14K yellow gold creates a warm and inviting appearance in this 14K yellow gold infinity braid wedding band from Apples of Gold Jewelry. The beautiful 14K yellow gold makes this wedding band look even more special, and when you take the stunning braided infinity loop pattern which stretches across the front of the band, you find yourself with a highly appealing and deeply meaningful wedding band that is perfect for the couples who know that their love with last forever. This beautiful wedding band can also be paired with a diamond engagement ring to create a complete set. 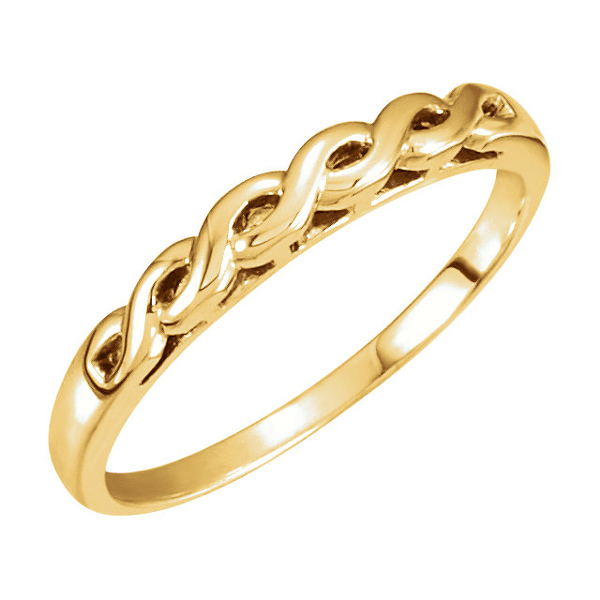 We guarantee our 14K Yellow Gold Infinity Braid Wedding Band to be high quality, authentic jewelry, as described above.